Today I have time to tell you something else about the Knitter's Fair, so I hope you're comfy. Remember I said that meeting Anne Hanson led to more shenanigans with my wallet? Well, that isn't quite true, because it would have happened just from her samples being out on display at the Shall We Knit? booth. There were a lot of samples. Some I recognized immediately as they have been in my queue a long time, and seeing them reminded me I really should get going on them. And one hadn't made it into the queue at all because while I admired it greatly, I didn't think it would look nearly as nice on me as it does on Anne, and also I do have some shreds of common sense left in me. a girl with three sweaters on needles that first climbed on more than four months ago and are nowhere near completion, even if one of them is baby-sized, should not be looking at another sweater. But there it is... and there it was... the sample for Leaving, hanging up at the side of the table. It is a stunning, stunning piece of design and looking at it in person I could see that it would in fact look - at the very least - just fine on me, and more importantly that I would feel like a million bucks in it. The damage was done even before I got chatting with Anne about its various features, and when I left the booth it wasn't just with two big pillows of roving, but with a copy of the pattern. La la la, and now I need about 1500 yards of yarn and let's not talk about time or lack thereof, okay? One of the yarns Anne suggested in this particular version of the pattern is from Waterloo Wools, and since I had noted this shop as One I Must Visit At The Fair, I spent the last twenty minutes of my stay hunting it down. I still don't know how I kept missing it. Thankfully I arrived during a brief lull in the traffic there, and Lindsey was able to talk to me about my predicament, which wasn't even the best part because frankly it is pretty awesome to be able to tell an artist that Anne Hanson has recommended her work for a fabulous cardi pattern. Lindsey didn't have 1500 yards of any one colour at the booth, but offered to dye for me whatever I liked on the base yarn of my preference. 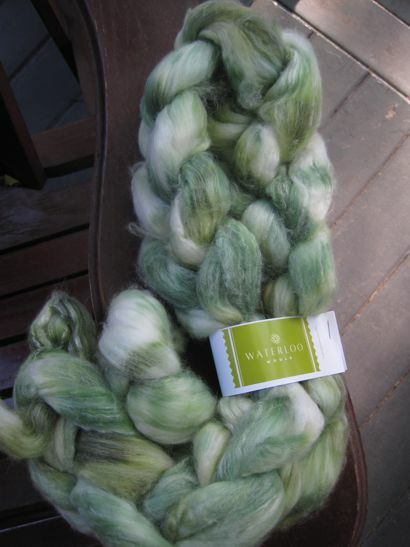 Anne suggests for Leaving a silk/camelhair blend called Winterbourne, but I kinda fell for Kawartha, a springy 100% Blue-Faced Leicester yarn which will - of course! - be more expensive. That choice set aside for the moment, I was free to look at those colours. People. You have got to check out Waterloo Wools because never mind the base yarns, which are just Wow, the colours are amaaaaazing and the names even more so. Because I am still obsessed with green cardigans apparently in spite of having one down and another midway, I put Cool Cucumber and Celery Leaf at the top of my Leaving list. Then - as I was paying for that? Oh yes. More roving, right behind Lindsey's head. 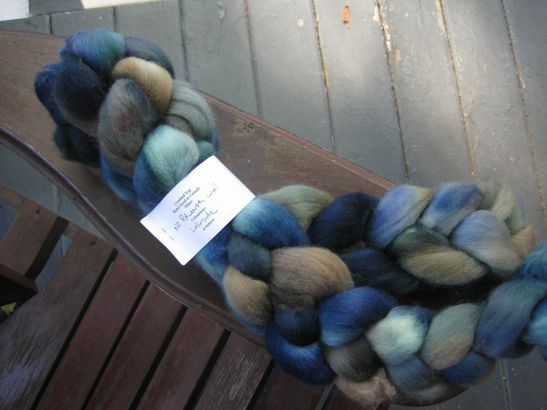 Now that I am home and being Sensible and also a little shocked at my terrible spending habits I am thinking of what a pain it is to alternate two strands of hand-dyed yarn for the duration of an entire cardigan. Also that I should use one of my two remaining massive cones of St-Denis Nordique for my version of Leaving while indulging my desire for Waterloo Wools' Kawartha yarn in less yardage-monstery hat or scarf or sock form. But then I think... No. What makes Leaving so lovely is the drape and subtle colour shifts you're only going to get in hand-dyed yarn on a silky base, and no matter how much I prefer knitting with wool, if I want that sweater I need to use that sort of material. Otherwise I will have a different sweater. It will still be lovely, but it will not be what I fell in love with. Also it will be an awful lot like two I have already knit. Of course I could shake up the problem slightly more for myself by getting Waterloo Wool for other projects and going with a Briar Rose yarn for the cardi. Shall We Knit supplies another Anne-approved variety (the name of which I will have to check about at the shop if I go that route) in the same colour as the reddish Briar Rose fiber I bought. Lighter green cardi, or deeper reddish cardi? You can see where I've really dug myself in deep this time. I'm a big fan of green so that gets my vote, those are some lovely braids of roving! I like them both. 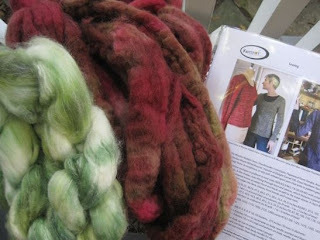 The thought of spinning enough to make a sweater is rather daunting to me.